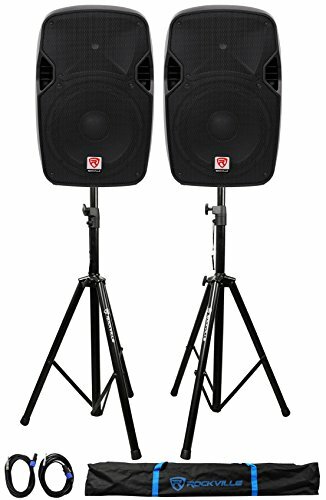 (2) Rockville SPGN124 12'' Passive 2400W DJ PA Speakers+Stands+Cables+Carry Bag by Rockville at IGWT. MPN: (2) SPGN124+RVSS2-TSNL4. Hurry! Limited time offer. Offer valid only while supplies last. The Rockville SPG SoundGig series passive loudspeakers are a quick way to expand your system, allowing you to add speakers and more power as needed. 12" Passive 1200 Watt 4 Ohm Lightweight DJ PA ABS Cabinet Speaker. Power Handling: 300 Watts RMS / 600 Watts Program Power / 1200 Watts Peak. High power long-throw 12'' woofer with 2.5" aluminum voice coil provides incredibly deep bass and acoustic power. High-power 2-way pro sound reinforcement speaker system for live sound and play back applications. Compact and light weight system delivers distortion free sound even at extreme SPL. State-of-the-art 1.35'' Japanese made pure titanium-diaphragm compression driver for crystal clear high-frequency reproduction. Twist-Lock speakon input and output connections. Stage floor or stand mounting with 35-mm pole socket. Ultra-wide dispersion, 40° large-format horizontal wave guide horn molded directly into the cabinet. This heavy-duty universal stand can be used as a Speaker Stand or a Lighting Stand! It's sturdy steel construction and custom carrying case add to the quality and support this stand gives. The sturdy and expandable long tripod legs ensure that your speakers will be stable in any environment. This package also comes with two 20 foot 1/4" Speakon NL-4 cables!